The Karakachan is one of Europe’s oldest dog breeds, originating in Bulgaria. 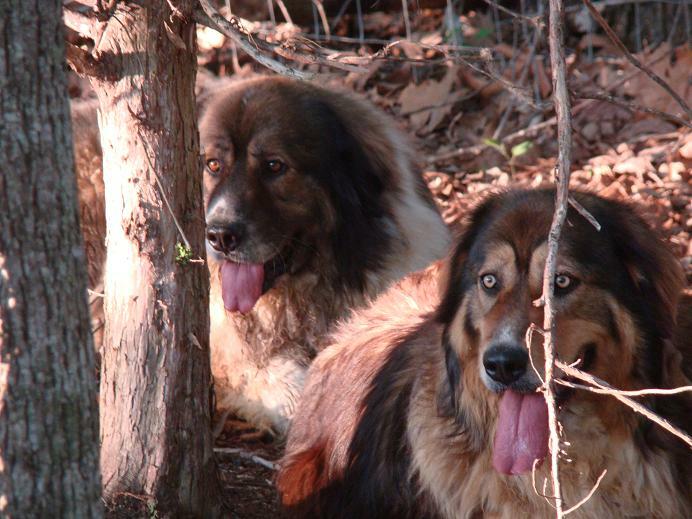 Today, there only a few hundred Karakachan dogs serving as livestock guardians in the U.S. We have two of them. They are a brother and sister pair, and half of our livestock guardian force. They came to us from a fainting goat farm in Tennessee that was closing down. Milos and Sofia (FiFi) weigh around 150 pounds each. They had a rough start on Missing Willow Farm. The day they were delivered they were released in our front yard, without collars, and immediately ran off. It took over an hour of coaxing, but they finally made it into our small pasture where we spent a good month socializing ourselves to them. They started out very skitterish. This is a photo taken of them during that timeframe. They hung together in the wooded area of our small pasture. We finally got to the point where they were both approachable, and were able to erect a fenced chute between pasture gates and got them moved over. They are now happy social members of our menagerie. 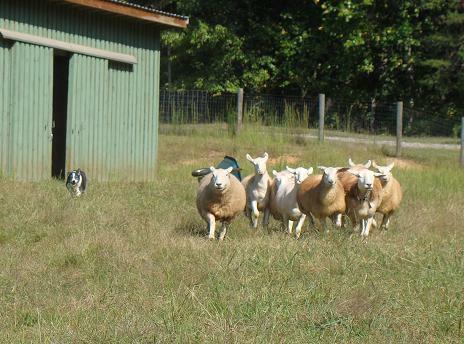 They have understood from day one that our border collie Jenna is a working member of our family and have not expressed any menace towards her. Milos loves to chase vehicles along our half mile driveway from inside the pasture. We have clocked him at over 30 MPH. They are magnificent dogs and we feel very lucky to have them. That’s all it takes to get Jenna to bring us our sheep. Ask her to sit beside you then say ‘shhhhh’ and she tears off to get them. She knows other commands; ‘come by’, ‘away to me’, ‘look back’ and I’m sure more than we even know about but ‘shhhhh’ is my favorite. Jenna’s favorite is ‘get it’. It’s used when there is a stubborn sheep who decides to stand up to her instead of move. It gives her permission to nip to show who’s boss. She loves to show who’s boss! Nugget came to us from a friend who works next to our local four lane highway. A state trooper pulled over a pickup truck in front of their business and, when they finally drove away, this pretty little chicken was left on the side of the road. She must have escaped, thought she was going to the slammer! A live trap was set but she wasn’t having anything to do with it. She seemed lost but wouldn’t fly away. It was two weeks before she took the bait. She was delivered to our chicken yard and immediately escaped through our barn’s rafters. We thought that was the last we’d see of her but she hung around on the outside of the barn and eventually joined the other ladies. We looked her up in our chicken photo book (you have one of those, too, right? ), she’s a seabright. She surprised us when she started laying tiny little eggs, then again when she started sitting on them (and everyone else’s eggs). She’s our only broody chicken. We just sneak the eggs out from under her. Maybe we’ll get her a tiny rooster so we can have tiny chicks! Actually, chevre. You know, those really expensive logs of tangy creamy cheese you can find in the fancy cheese section of your grocery store? This isn’t meant to be a tutorial, it’s just because most folks are curious about it. You start with 3 ingredients. Culture, rennett and goat milk (thanks Sophie and Bella!). The culture and rennet come from a cheesemaking supply company. I met a representative from Dairy Connection at a homestead cheesemaker’s course I took a few years back. I like their products so purchase my culture and rennet from them. It doesn’t take much. Just 1/4 tsp. of culture and 2 drops of rennet per gallon of milk. I bring the milk to 75 degrees in a double boiler then stir in the culture and rennet. From there, it sits at room temperature for about 4 hours where it becomes a single mass of curd. I check for a clean ‘break’ in the curd and know it’s time to cut into smaller chunks. After about 20 minutes, the cut curds start to seperate from the whey and it’s time to ladle into chevre molds. They have tiny holes in them for the whey to escape. This sits at room temp. over night and in the morning, we have cheese. These get lightly salted and stored in the fridge. We can’t sell it because we’re not a state inspected Grade A dairy, but we can give it away. Homemade cheese makes a very nice present! I usually check on the chicks in the morning after I milk the ladies. Today, I went into the barn instead to give our hens some cucumbers from the garden. Hubby checked on them instead and called to me to stay in the barn and I knew there was a creature who shall not be named about. A legless lizard. A demon that starts with an ‘s’ and ends with a ‘nake’. I can’t even say it… After much commotion including delicious clubbing sounds, the coast was clear. Did I ever tell you my husband is my hero? Superhero. One of our chicks was dead in the chicken tractor. We removed the heat lamp & the tarp and drug the tractor into the pasture where there are really (really) big dogs. If they freeze to death, so be it. If we left them where they were this morning, they would starve to death because I would never go in and feed them again. I’m just saying…. Well… theoretically it’s all free when it’s your animal, and this is our Helen on the milking stand. Goats, like all mammals (people included) produce milk after they have given birth. So.. in order to milk a goat, she needs to have had a kid (goat babies are actually called kids). The strange thing is, Helen didn’t have a kid this year. But when she saw the other goats nursing their kids, she filled right up. We’ve been milking her for a few months now. Yes, she’s lopsided, but she thanks you very much for not mentioning it. One of the best things about raising your own food is you don’t have to worry about those big industrial recalls. That plus the fact that your own food is delicious! 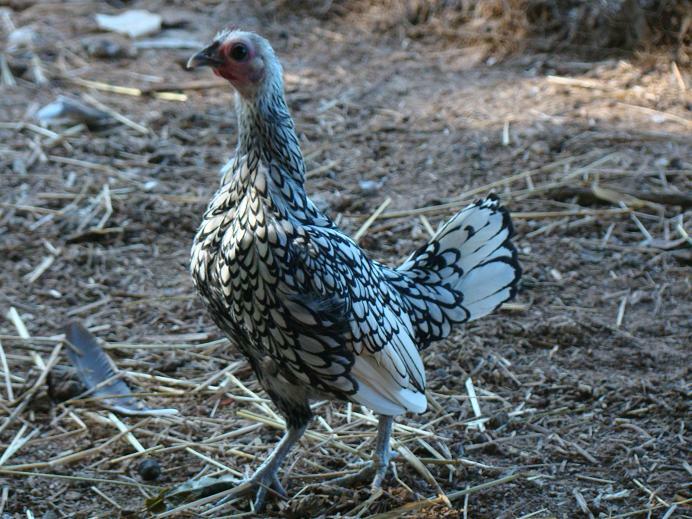 This lovely blue green monster is from Cranberry, our americauna chicken. 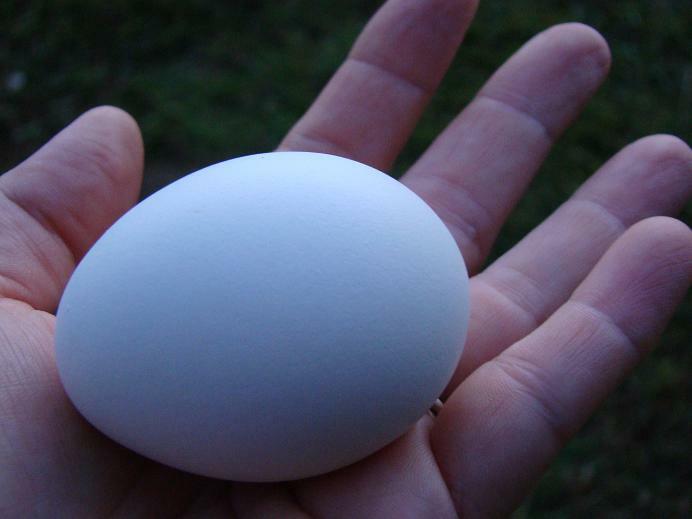 Americaunas are also know as easter eggers because they lay colored eggs. Our family loves to have eggs for breakfast when they visit because farm fresh eggs are so tasty.